I was not expecting A Cornish Christmas to be as serious as it was (another example of when not to judge a book by its cover! )- I was expecting a more light-hearted novel full of holiday cheer but instead found myself in a novel on an emotional journey. That sounds negative but in fact it is the source of the subject matter than can be seen as difficult rather than the way it is explored in the novel. Ivy and Stuart have been navigating infertility issues for a number of years with many sad and devastating results. They are finally in a position where they can perhaps look to being happy but it’s a two-sided coin for Ivy as it has also brought back up to the surface the loss of her mother which she is feeling with an intensity I could feel on the pages. I loved the way Lily Graham treated both these subjects. She gave Ivy realistic bouts of frustration and sadness but didn’t allow Lily to become maudlin. 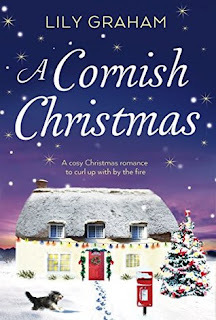 Somehow, despite their history there is much light in A Cornish Christmas. Graham also delved into creating characters that both support Lily and Stuart in their lives and provide lighthearted relief when things were tough- from Stuart’s interfering mother to the dog Lily’s career as an illustrator is based on there is no person (or animal) that is left out. The magical quality to Lily’s relationship with her mother could have come across as clichéd but I didn’t find it that way- it was done in just the right way that inspired hope and love. I adored Graham’s story and was so pleased it came up on my list of to-reads.